This racket is among the fastest in the commercially available rackets. Using the perfect combination of TAMCA 5000 high-density carbon fiber and Hinoki cypress wood, this racket is a rare and fast attack racket with exceptional speed and stability. More thicker than the Butterfly Primorac wood layer , with high hardness sponge high-power front arc circle ball absolutely no problem, if you want a higher degree of stability and rotation, let the ball fall into the table into the lower arc of the forward ball is used Soft cake sponge on it. Coach Tony, a Table Tennis Coach from Taiwan, M.I.T. I Love Ping Ping brade is espcially made a cooperation with OEM, the world famous table tennis products factories in Taiwan. Strict selection of cypress wood, materials and master craftsmen's hand-made. 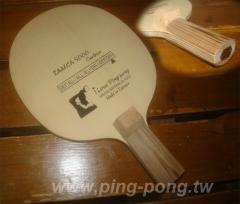 Forehand face selected Hinoki TAMCA 5000 carbon fiber surface. TAMCA 5000 Carbon surface, the thickness of the plate thicker 7.2mm, touch the ball when the initial speed to accelerate quickly from the plate, the forward arc low flat with absolute destructive, if the soft cake sponge fell to the other after the turn table (2nd speed). It will also make the forward arc drop rapidly after the table is dropped, making it more difficult for opponents to return the ball. Because of the thick soft Hinoki cypress cushioning, stable batting situation and the first Two strong turning edge to become the characteristics of its board.